Drive: Multiplier Mayhem is an exciting five reel and three row slot game, with 15 pre-set paylines and loads of multipliers to increase the total possible winnings from numerous different bet levels and coin values. The game’s theoretical return to player percentage is 96.7% and a number of different special symbols allow for free spins, wild substitutions and other bonus features. As its name suggests, Drive: Multiplier Mayhem is a racing themed slot that makes great use of multipliers to increase the potential jackpots that players can win. To best understand how the game works and what players can expect from it, we have taken a close look at the game’s top jackpot, special symbols, paytable and betting limits. This particular slot is one of a few which state at the outset what the top jackpot amount is, and in this case it is 750,000 coins. With a maximum coin value of 50p therefore, that top jackpot can be worth a hugely impressive £375,000 to any player who wins it. Explaining how the top jackpot can be won however is a little complicated, as that imposed maximum is actually below the theoretical top payout for the most valuable spin possible according to the game’s paytable. Drive’s most valuable purple haired driver symbol after all, pays at a rate of 150 times the current bet level, which at the maximum 120 times multiplier (more on that later) and bet level ten equates to 180,000 coins per line (150 x 10 x 120). With 15 paylines therefore, the theoretical top jackpot should be 2,700,000 coins (180,000 x 15) but it is little surprise that the jackpot is capped before that point. Themed around street racing and mostly focused upon multipliers, it is little surprise that Drive’s special symbols are all related to those two elements. 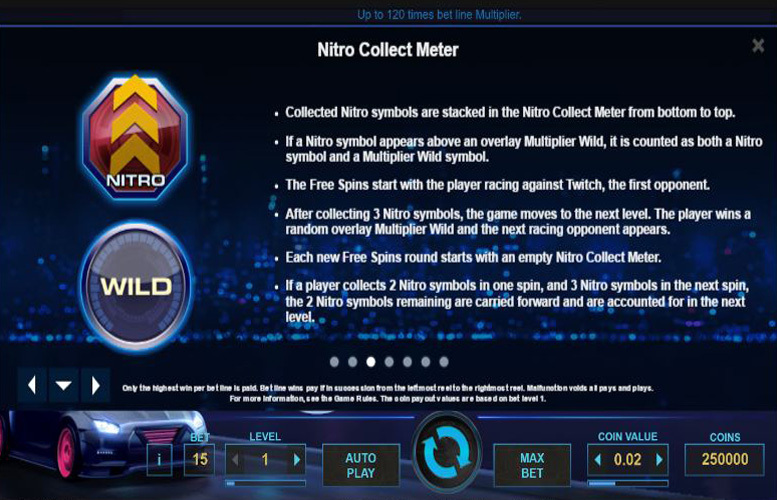 There are three different special symbols within the game, with the Multiplier Wilds symbols and the Scatter symbols present in the main game and the Nitro symbols only appearing during free spins. Multiplier Wilds are arguably the most important symbols within the game, can appear anywhere on reels 1-5 and substitute for all other symbols apart from Scatter or Nitro symbols. The wilds go toward producing the most valuable possible combination on any payline that they are a part of, and also apply a multiplier to any winnings. The multiplier of each Multiplier Wild depends upon which reel it appears on, with a wild on reel one providing no multiplier, a wild on reel two providing 2 times the winnings, reel three offering 3 times and so on. 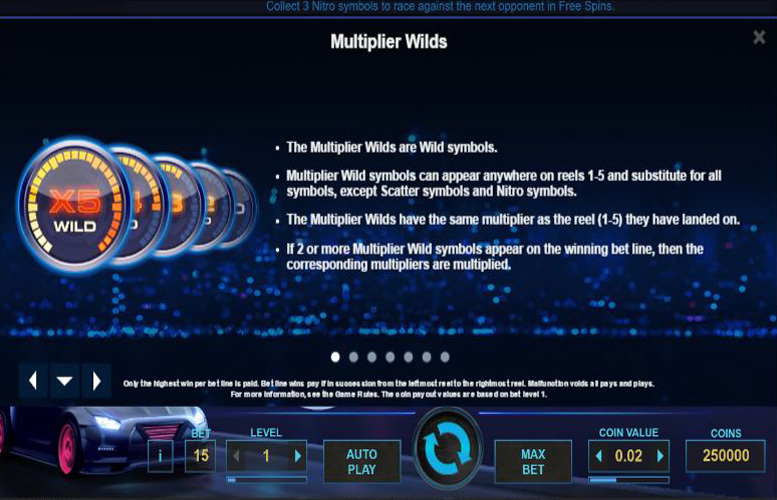 If more than one Multiplier Wild appears on a payline, the multipliers of the symbols are themselves multiplied to offer a maximum potential multiplier of 120 times for each payline (1 x 2 x 3 x 4 x 5). Scatter symbols are another important element of the Drive slot, as three of these appearing anywhere on reels 2, 3 and 4 following a spin activate ten free spins. 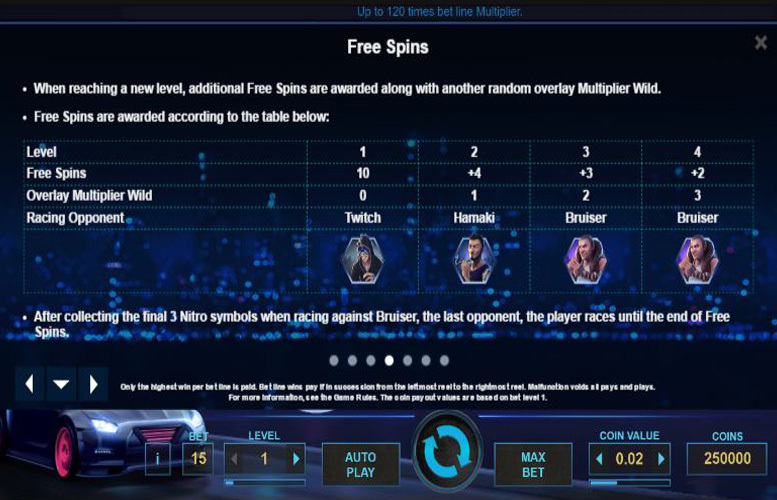 Those free spins are played at the same bet level and coin value of the spin which activated them and it is during these free spins that Nitro symbols can also appear. Three of those Nitro symbols appearing on reels 2, 3 and 4 fill a player’s ‘Nitro Collect Meter’ and as a result both award extra free spins and help the player ‘defeat’ the driver they are racing and move onto the next opponent. There are four different rival drivers to move through and each time one is defeated by the filling of the ‘Nitro Collect Meter’, further free spins are also awarded. The symbols used on the reels of Drive: Multiplier Mayhem are all themed around supposed street races between a player’s driver and a selection of rivals. The five most valuable symbols in order are the player’s own purple haired driver symbol, the rival named bruiser’s symbol, the car symbol and then the other two rival driver symbols. If a player achieves any one of those five symbols on all spaces of reel one and then a Multiplier Wild on all other spaces across the reels, they will win the top jackpot of 750,000 coins which can be worth £375,000 at the highest bet level and coin value. 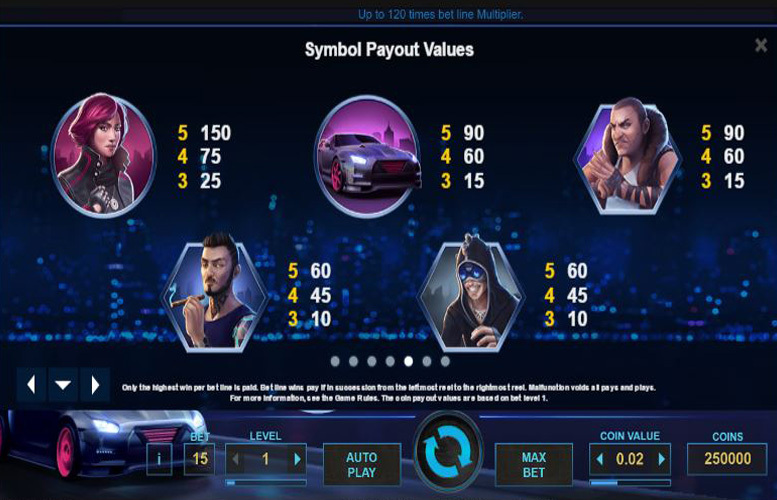 The top jackpot available without any multiplier applied equals a total of 22,500 coins and occurs if a player fills all spaces on all reels with their own purple haired driver symbol. The 15 paylines of this slot are pre-set but players can control how much they bet per spin by setting both their bet level and their coin value. Coin value can be set at six different levels between 1p and 50p and the ten bet levels from 1-10 dictate how many coins are wagered per spin. Each bet level adds an extra coin per payline, so at the two lowest levels a player’s total bet would equal 15p (one 1p coin per line) and at the highest levels it would equal £75 (ten 50p coins per line). Drive: Multiplier Mayhem is the perfect slots game for any player who wants an attractive and yet simple slot which offers the potential for huge winnings. 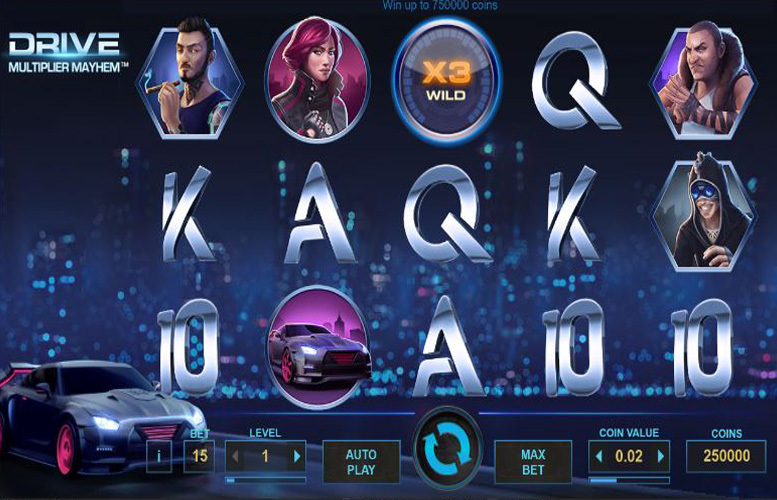 The night-time street racing theme of the game allows it to boast attractive and interesting graphics and symbols, whilst the actual gameplay of the slot remains relatively simple. The racing element of the game is not really a bonus game as it is simply built into the free spins feature of the slot and aside from those free spins it is just the multipliers that Drive has that elevates it beyond a straightforward, traditional slot. Those multipliers too, are what allow the game to provide a top jackpot that is potentially extremely high and which at the top bet level and coin value can be worth £375,000 to a player. That is undoubtedly one of the most impressive fixed price jackpots around and is enough to make Drive: Multiplier Mayhem a really attractive slot, even without taking into account the game’s other aforementioned advantages. This game has a rating of 5 / 5 with 563 total reviews by the users.